The tooth structure comprises of outer enamel, intermediate hard dentin and an inner soft pulp. Root canal treatment is required when the pulp of the tooth becomes inflamed or infected. Root canal treatment involves removal of the infected pulp tissue, disinfection and cleaning of the pulp camber, followed by filling and sealing of the chamber with a biocompatible material called gutta-percha. Following root canal treatment, the tooth is thereafter restored with a tooth-colored filling or a permanent crown. How many visits would a Root Canal Treatment require? Root canal treatment may require one or more visits. An uncomplicated root canal treatment can be completed in one visit. However, in cases where the entire pulp chamber is infected and patient experiences pain, swelling or tenderness at the time of the appointment, the dentist may then choose a multi-appointment approach. What are the possible side effects of a Root Canal Therapy? Following root canal therapy, the tooth tends to become brittle, which why it is important to complete the restoration with a dental crown to protect the tooth. Some post-op pain for a few days is normal following root canal treatment and over the counter pain medications will help alleviate this pain. Dr. Maisour Rachi is our Specialist Endodontist (Root Canal Specialist) with over 22 years of clinical experience. 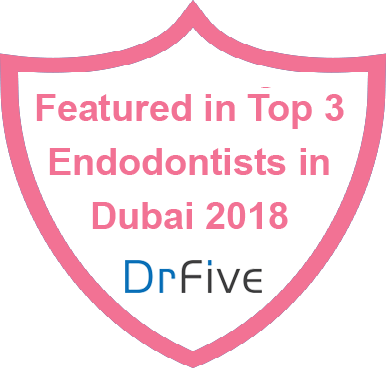 Prof. Dr. Maisour has completed his PhD in Endodontics and was the Director for Endodontic courses conducted in Lebanon, KSA, Syria and UAE. Dr. Maisour’s philosophy is to eliminate discomfort and use minimally invasive techniques to the tooth structure while performing root canal treatments. Our senior British dentist, Dr. Zul Paliwalla (King’s College, London) has practiced in the UK for 33 years and his experience includes providing high-end general dentistry on Harley Street, Central London. Dr. Zul is renowned for his gentle, pain free dentistry. Dr. Anupama Jaswal, our family dentist, has over 20 years of extensive clinical experience in restorative dentistry with special interest in endodontics (root canal treatments). We encourage you to call us on 04 3987075 if you require any further information.